TalkSport are again running the best Premier League predictor game on the planet. Not only is it the best but players have a chance to win a £1 million jackpot. The rules are simple - just predict the results of all the Premiership games. Just 5 minutes of your time a week and a lot less time consuming or complicated than Fantasy Football. My mate and Cheltenham Town supporter SteveStar has opened a Cheltenham mini-league which is open to all. He will be more than happy for all those interested in the Predictor game to join. Last year I was one of his players as I am this year. I played with the Chelteham Town FC crest next to my name and will continue to do so this season. But being a cheeky so-and-so that I am and a FGR season ticket holder, I've opened a league FOREST GREEN ROVERS and am inviting those who like a challenge to join. The code for this league is FD8E5-QJT. There are already four players with the Cheltenham crest registered to play in this other Gloucestershire Predictor league. So you would be amongst friends and most sincerely welcome. Looks good - shame it is on TalkSport - a website or radio station I will never access again. I bet they're missing you. Completely. Only this morning another letter on the doormat begging me to tune in again. Actually it is not TalkSport who run the Predictor Game, that's Sports Fusion and it appears to be sponsored by SELCO, which I think is a builder's merchant. Predictor Game has only been under the TalkSport umbrella for a few years. So lads don't be deterred from joining competition - it is free of aggressive advertising and damn good addictive fun to play. BTW both Cheltenham and FGR have a mini-league entered, and both are currently amongst the top supported football teams in the competition. And that includes Premiership sides. FGR have an extra player to Cheltenham, so for bragging rights how about a few of you joining to tip the balance in Cheltenham's favour? For the first time, probably ever, a player whose team wear the Cheltenham badge is as high as 2nd out of 123,667 players. I have no idea who >JLM1510< is, but if he a member of this forum I'd like to offer him my sincere congratulations. Also last year a Cheltenham player was at one time in the top 100 players. Admittedly there are fewer Cheltenham players than for some other clubs, but I'm pleased to say that the few of us are doing very well. How much commission are you on OTC? I've been a bit quiet on this thread for a while, so thought that I'd give you an update. I'm rather chuffed that I'm top of this Cheltenham mini-league with 940 points (145 points better than next player) but I'm also the best registered Cheltenham Fan player (of just under 90 players) in the whole TalkSport Predictor league with 80 points more than next best player. Now you guys who play this game, you've got a real target to aim for. Good news for ctfc but bad news for The Old TomCat, the player masquerading as a ctfc fan. The Old TomCat has been knocked off top of table of all players with the ctfc crest against their name. A lowly score this week of -5 pts was enough to displace TomCat by JLM1510 (whoever he is) who managed a score of 100 pts and now leads TomCat by 50 pts. JLM1510's score of 950 pts is 77th best out of 129,330players. But the TomCat is not too far behind him with 900 pts and is 175th best player. 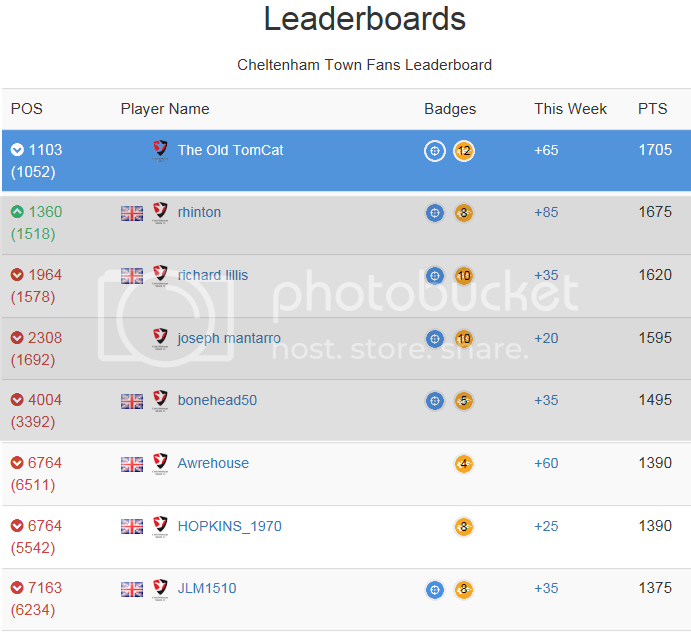 However TomCat still leads the Cheltenham mini-league that is run by fanatical ctfc supporter SteveStar. Premiership football season has ended and THE OLD TOMCAT has become the best player worldwide of those who entered Predictor competition under a Cheltenham badge. (Sadly no FGR badges available ). TomCat's team might have missed out on promotion into Football League but he is doing better than alright with his forecasting and has won two money competitions overnight. Well done! A feat made all the more remarkable given your singular lack of success at predicting the results of the National League title race on here. I've noticed that Martin Griffin has opened a CHELTENHAM mini-league for the forthcoming Euro 2016 Championship. Unless he uses a different name on forum and Predictor I don't know him. Good luck to him but I won't be playing Predictor this summer. But I will be playing it again under a Cheltenham badge next season and hoping to win it again. Actually I was more than accurate with my predictions. During the warm up games, most of which I attended, I said that I was impressed with Cheltenham and they would do well. Just after Christmas I said that the title was Cheltenham's to lose. I also said Cheltenham would have a dip in form after Christmas, which they did, but it was a lot less than all their nearest competitors. I was just a couple of points out with my forecast on how many points Cheltenham would end the season with, and that was a lot better than most on this site. I topped the Cheltenham Predictor competition for most of season. Anyway that is all history. I have already congratulated title winning Cheltenham Town FC and now wish them the very best for Season 2016/17. The real reason I posting is that our mate SteveStar who is a Cheltenham Town supporter has opened up his annual Predictor Competition and is looking forward to having as many players in his mini-league as possible. It's free and fun to play. I'm in, so hopefully a few of you guys also join just to try and beat me. BTW I'll be at tonight's game against Barnsley, so hopefully meet some of you guys in friendship. Pleased to tell you guys that once again The Old TomCat was leading points scorer in the Cheltenham mini-league of the international IKTS Predictor game. Champion two years on the spin. 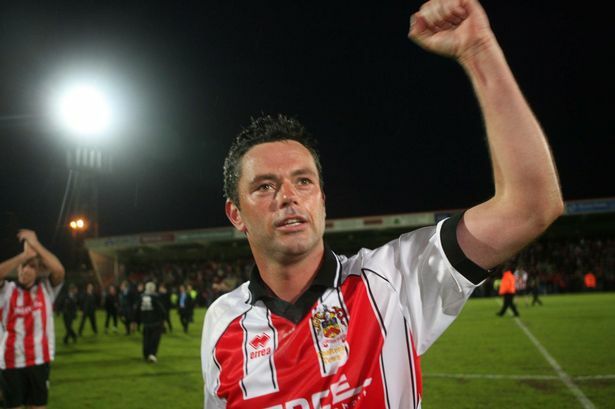 Cheltenham Town supporter Steve has started his annual Predictor mini-league and is looking for players to enter. The Old TomCat has finished top of this mini-league for the last two seasons and will again be entering to try and make it a hat-trick. On behalf of Steve I invite all on this forum to enter and try and de-thrown me. Steve has offered everybody Good Luck. Someone's got to put a stop to the madness of you winning every season. I'll rise to the challenge. Maybe. On behalf of Steve: Thanks and good luck. Always more fun to play against a greater number of competitors. Shade, I seem to remember you took part a few seasons ago but cannot remember how successful you were. I will play if you do it all for me as Talk Sport is not allowed in our household or any of our devices. I can't remember either. I was probably ahead for a long time and then fell away toward the end. OTC, am I in the mini-league? I know I was when I signed up, but I can't find it now. Not that I'm going to be anywhere other than bottom 1/5 anyway. Regret to say that you are currently 15th. Mind you there were some strange results this week and your luck will change for the better.